Scotrenewables Tidal Power has completed the deployment of its advanced modular anchoring system at the European Marine Energy Centre, Orkney in preparation for the installation of its SR2000 2MW floating tidal turbine. The project was supported by the Scottish Government’s Marine Renewables Commercialisation Fund, which was established to support the development of enabling technology for marine energy arrays and by Invest NI. 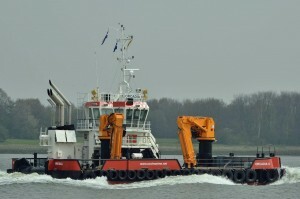 Scotrenewables’ aim is to reduce the levelised cost of energy for tidal energy generation by engineering out expensive, highly specialised vessels in preference for lower cost workboat style vessels for all major aspects of installation, maintenance and decommissioning of its floating tidal turbine and anchors. The engineering challenge has been to maintain this design approach as the company’s technology and its anchoring requirements have increased in scale. To achieve this, Scotrenewables, in collaboration with our partners McLaughlin & Harvey and Scotmarine developed a novel installation methodology where locally cast, modular interlocking anchor blocks, could be transported to the quayside and placed on the sea-bed where they would be picked up for deployment on site using specially designed, remotely operated lifting equipment mounted on readily available work boats. Manufactured by McLaughlin & Harvey, the pre-cast fibre reinforced concrete anchor modules were placed on the sea-bed adjacent to the quayside at Hatston using local heavy lifting engineers Heddle Construction. From there, the anchor modules (each in excess of 64 tonnes) were transported to the EMEC tidal test site at the Fall of Warness, off Eday, some 30km away by Scotmarine’s MV Orcadia II workboat with the use of the bespoke deployment frame. The system, approach, installation and decommissioning procedures were developed from initial concept through to full-scale demonstration and deployment over the course of the two-year project, with the last module being installed last week. Final tests will come when the SR2000 is connected onsite in the coming months.